Reference number for this case: 11-oct-54-Clamecy. Thank you for including this reference number in any correspondence with me regarding this case. The same adventure happened to two stallholders of Clamecy (the Nièvre), Misters Henry Gallois and Louis Vigneron who went by van early, at the fair of Corbigny. "Whereas I circulated on the middle of the road", declared Mr. Welsh, "I felt like a discharge of electrical power on all the body. A few seconds later the engine of my car stopped and the headlights died out." Aimé Michel notes that the observation took place a quarter of an hour later than that of Fonfrède this same day, that is to say at 4 hour thirty minutes. The witnesses are Henri Gallois and Louis Vigneron, fair merchants in Clamecy, who were going to the fair at Corbigny. "I was driving on the middle of the road not far from Clamecy, when suddenly, near the location called Sassier, I felt like an electric discharge in my entire body. At the same time, the engine stopped and the headlights died out. Paralyzed, incapable of making any movement, we wondered what happened and looked around us. At this point in time, in the field bordering the road, at about fifty meters, we saw a round craft, and near it, we could very clearly distinguish three beings of small size which moved with sharp gestures. Their silhouettes soon disappeared in the silhouette of the craft, which flew away quickly. Almost at once, our headlights were re-ignited and we could leave." Michel indicates that Mr. Vigneron confirmed all the details of the account by Mr. Gallois. NICAP listed that on October 11, 1954, in Clamecy, the Nievre, France, a Car motor and headlights failed, passengers felt a shock and numbness, a round UFO took off from nearby field. Three little beings moving with lively gestures. A quarter of an hour later [than the case at Fonfrède on October 11, 1954, at 4 a.m.], 250 kilometers farther to the north, Henry Gallois and Louis Vigneron, merchants at Clamecy, were going to Corbigny, when an astonishing adventure occurred to them. "I was driving in the middle of the road not far from Clamecy," said Mr. Gallois, "when suddenly near the place called Sassier I felt my whole body feel like an electric shock. At the same time the engine and the headlights stopped. Paralyzed, unable to make a move, we wondered what was happening and we looked around, and then, in the meadow bordering the road, about fifty yards from us, we saw a round machine near which we could very distinctly distinguish three small beings moving with lively gestures, their silhouettes soon disappeared in that of the machine which flew rapidly, and almost immediately our headlights rekindled and we were able to set off again." The day having risen, one had to wait till the evening to witness new and strange encounters. The author indicates that on October 11, 1954 in the Saone et Loire, "Gallois and Vigneron. Car. Round machine and small pilots at 50 m of the edge of the road. The witnesses feel an electric discharge. Stalled engine. Extinct headlights. (M. II, p. 268.)" Michel Carrouges further lists as a case with small occupants but lacking details that with Mr. Gallois as witness, near Clamecy in the Saône-et-Loire, on October 11, 1954. He notes that Mr. Gallois saw the saucer well, but that he was unable to see details of the small beings. Clamency (Nievre) France. October 1954 'Electric shock', car engine & headlamps went out same time. 150 feet. Oct. 11, 1954, 04:30, Sassier, near La Carie (France). The NICAP book indicates that on October 11, 1954 in Clamecy (Nievre), France, a car motor and headlights failed, passengers felt a shock and a numbness; a round UFO took off from a nearby field. The author indicates that on October 11, 1954, a salesman of Clamecy who was going by car to the fair of Corbigny with a friend, reported that the engine and the headlights of the car stopped suddenly. He felt something similar to an electric shock and then saw an apparatus which had landed in a pasture within approximately 50 meters of the road. It was cylindrical, of a rather broad diameter, and three small characters were standing at its side. The only visible light was a small reddish gleam which was compared to a lighted cigarette tip. The two witnesses were unable to move. When the apparatus flew away, they could resume their trip. The authors indicate that in Corbigny in the Nievre, on October 11, 1954 at 02:30 p.m., Henri Gallois and Louis Vigneron, stallholders of Clamecy, went to the market of Corbigny and while arriving near this city, they felt "like a violent electric shock." At the same time their engine stalled and the headlights died out. "We then saw in a meadow, at the edge of the road, a round craft with three small beings busy nearby. They soon disappeared inside the craft; which took off almost at once. The truck's headlights then relit. The truck's engine started at the first use of the starter." The authors add that in a nearby hamlet, a farmer saw a luminous craft rise behind a wood and disappear quickly in the clouds. Among those cases, he indicates that on October 11, 1954, near Corbigny, France, a salesman and his friend experienced a sudden failure of engine and headlights and electrical sensation in their bodies. Then a craft was observed about 150 feet away, off the road, approximately cylindrical in shape. Three small humanoids were seen nearby, and the witnesses found themselves unable to move until the occupants and craft had departed. The authors indicate that Mr. Gallois and Mr. Vigneron, of France, saw a craft only 50 m away in a pasture on October 11, 1954, and were paralyzed until the craft left. Mark Rodeghier indicates that on October 11, 1954, at 0430, in France, near Sassier, Henri Gallois and Louis Vigneron, driving to a fair at Corbigny, both suddenly felt electric shocks through their bodies. The motor of the car died and the headlights went out, they became paralyzed and saw on the ground, 50 yards away, a round object and three small figures beside the object. The figures disappeared into the object, which then left rapidly. The headlights came on, the paralysis ended, and the engine could be restarted. A resident of a nearby village reported a UFO at the same time. The source is indicated as "Michel." The author indicates that on October 11, 1954, in Sassier, near La Carie, Mr. Gallois and Mr. Vigneron who were driving from Clamecy to Corbigny, felt an electric shock as the headlights died. They then saw a craft in a pasture fifty meters away. It was cylindrical and fairly thick, and three small beings were standing close by. No light was seen, except a red point. Both witnesses were paralyzed until the craft left. A third witness had seen a lighted object fly over the woods at La Carie. 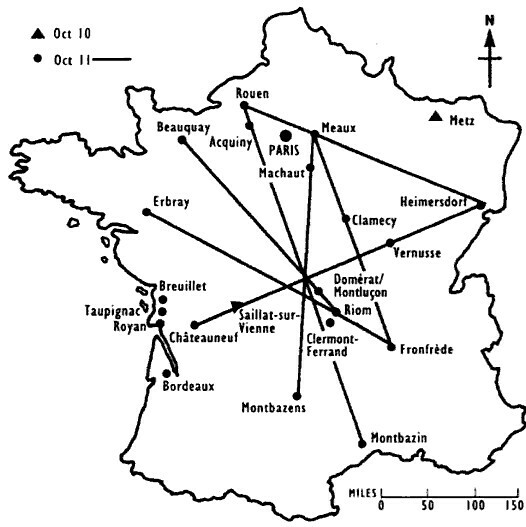 In his chapter on the cases of paralysis or drowsiness of UFO witnesses during their experience, Pierre Delval indicates 12 cases from the French flap of 1954, among those, that in Corbigny in the department of the Nièvre, on October 11, 1954 at 04:30. Henri Gallois and Louis Vigneron, stallholders, went by truck to the Corbigny fair when at the place called "Sassier", Gallois suddenly felt like an electric discharge in all his body. At the same time, the engine stopped and the headlights died out. Paralyzed, unable to make the least movement, they looked around them while wondering what occurred, and then saw that there was a round craft with three beings of small size busy around it in a meadow bordering the road, at approximately fifty meters. The beings soon disappeared in the craft which took off quickly. The headlights re-ignited and the two men, masters of their movements, managed to resume their travel. A third witness, Mr. Chameau, saw the scene partly, and confirmed the account by Gallois and Vigneron. The authors indicate that on October 11, 1954, at 04:30, in Clamecy, Henri Gallois and Louis Vigneron, stallholders domiciled street of the Market in Clamecy, going early to the Corbigny fair, hardly came to leave Clamecy at the locality "Le Fassié" that their van stalled and the headlights died out, whereas a few seconds before they had felt like an electrical discharge on all the body. They then saw, in a field bordering the road, a round apparatus of a rather large diameter and a a greyish color, from which they did not distinguish the details, and near the apparatus, three small silhouettes moving with fast gestures, disappearing quickly in the craft which flew away quickly. At this time, the headlights of their vehicle re-ignited, and their engine started at the first use of the starter. Mr. Gallois stated at his arrival in Corbigny to a journalist of "La Montagne" that at the time when the headlights died out and the engine stalled, he was awestruck for he saw at approximately fifty meters of him an "apparatus of cylindrical form of a rather large diameter that I could compare to the 'saucers'." He stated that he clearly saw on board this craft three beings of small size which appeared to him of weird shapes but with features he did not distinguish, that it seemed to him that one of them was smoking or else, that there was a small on board. He added that he and his fellow were immobilized in their vehicle, that it was impossible for them to move, that they were able to move only after the craft had left. He specified that the sighting lasted only a few seconds but that it was clear and that no doubt exists for him. Mr. Henri Chalumeau, cartwright in the locality "La Carie", certified to have also seen the craft. The authors indicate that the sources are the Vallée catalogue, case 234; Quincy; Aimé Michel in "A Propos des Soucoupes Volantes" p.196, C. Garreau and R. Lavier in "Face aux Extraterrestres" page 100; La Montagne for October 13, 1954, Libération and Le Parisien for October 14, 1954. The authors indicate that the newspaper La Montagne for October 15, 1954 "reports in detail" about a "peculiar observation whose alleged witnesses" were Mr. Gallois and Mr. Vigneron, stallholders of Clamecy, who witnessed the landing of a cylindrical object in a meadow at the edge of the road, when at the same time their vehicle stalled, the headlights died out and they felt a violent electric shock on the body. The authors indicate that the witnesses agree to saying that they observed three beings of small size and of weird form and "it seemed to me that one of them smoked, or else a small light was on board." The authors note that the newspaper article finishes on a question as for when the mystery of the flying saucers will be lifted, and that they have in their file a second article on the case, from Le Figaro for October 14, 1954, which does not mention occupants. They note that "in some books" it is claimed that the occupants of the craft were outside the craft. The authors say then that they found Mr. Gallois, that "he perfectly remembers the sighting", that he "confirmed" to them that it was a good joke, that the engine stall, headlights issue, electric shock were a "joke", and the authors conclude that "the smoking Martian has lived." Another electromagnetic incident took place 15 minutes later at Sassier where two travelling salesmen, M. Louis Vigneron and M. Henri Gallois, en countered a strange object and its occupants. In M. Gallois1 words: "I was driving in the middle of the road when suddenly near Sassier I felt something like an electric shock through my whole body. At the same time the car motor stopped and the lights went out.- Paralyzed, we asked ourselves what was happening. It was then that, in a field bordering the road about 165 feet away, we saw a round object. Next to it we saw clearly three short beings who seemed to be moving about quickly. Their silhouettes soon disappeared into the saucer-like object which flew off immediately. "Almost right away my lights went back on and we were able to drive away." 103. 101. Michel, Aime. "Flying Saucers in Europe." Fate. January 1958. p.76. Jean Sider indicates that on October 11, 1954, Henri Gallois and Louis Vigneron were in a car near Clamecy close to the hamlet of Cary, when Henri Gallois felt an electric shock, the engine stalled and that the headlights died out. A round object was then noticed in a meadow at 50 meters of the road, and three small beings which disappeared inside before it took off. Jean Sider indicates that another source says that one Mr. Chaumeau, resident of Cary, saw the object rising above the wood the same day at the same hour. Jean Sider indicates that the sources are Michel Figuet page 148, and Aimé Michel pages 196-197, that Figuet names the hamlet "La Carie" instead of Cary, and that Barthel and Brucker "abusively discarded" the case but that it is useless to debate on this. Jean Sider describes the case again at another page in a similar manner except the two men are said to feel the electric shock and witness the occurrence, and that Mr. Chaumeau is not mentioned. The Belgian ufologist indicates that on October 11, 1954 in France in Corbigny - Sassier in the Nièvre, close to La Carie, Messrs Gallois and Vigneron in a truck felt at 04:30 an electric shock while the headlights of the car died out. They saw an object in the pastures at approximately 50 m, cylindrical and rather thick, and three small beings standing near it. There was no visible light except a small reddish point. The two witnesses were paralyzed until the departure of the object. Mr. Chaumeau, independently of the two other witnesses, saw a luminous object flying above the wood of La Carie. The source is indicated as Jacques Vallée in "Chronique des apparitions ET", Denoel 1972, coll. J'Ai Lu, pages 275, 276. The Australian ufologist indicates that on 11 October 1954 at 0430 in Sassier, France, male witnesses Gallois and Vigneron, while driving they felt an "electric shock” through the body. The car motor stalled and headlights went out. They became paralyzed. 50m ahead of them they saw a machine and three small figures. These figures went into object and the object flew off. The car headlights came on and the paralysis ceased, and the engine could be restarted. The source is noted "Michel, A. 1958. Flying Saucers and the Straight Line Mystery. New York. Criterion Books. p158." John Schuessler indicates that on October 11, 1954, in France, in Sassier, at 04:30, Henri Gallois and Louis Vigneron, driving in a car, felt electric shocks to their bodies and became paralyzed. The motor of the car died and the lights went out. They saw a cylindrical object in the field and three small beings near it. When the UFO left, everything returned to normal. There was an independent witness also. The sources are indicated as UFO Reports Involving Vehicle Interference, CUFOS; Official UFO, Feb. 76; Michel. Donald Johnson indicates that on October 11, 1954, in Sassier, near La Carie, France two men, Messrs. Gallois and Vigneron, were driving from Clamecy to Corbigny when felt an "electric shock" at the same time their car headlights died. They then saw a craft in a pasture 50 meters away. It was cylindrical and fairly thick in shape. Three dwarf humanoids were standing close by. No light was seen, except a small, reddish point of light. Both witnesses were paralyzed until the craft left. A third witness, Mr. Chaumeau, had seen a lighted object fly over the woods at La Carie, France. The source is indicated as Jacques Vallee, Passport to Magonia: A Century of Landings, pp. 224-225. Luc Chastan indicates that on October 11, 1954 at 04:30 hours, two stallholders went to the fair of Corbigny. They had hardly left Clamecy, at the locality "Le Fassié", that their van stalled and the headlights died out. A seconds earlier, they had felt like a discharge of electrical current on all the body. They then saw, in a field bordering the road, at about fifty meters, a round machine of greyish color; of which they could not distinguish the details, and near this object, the moves with fast gestures of three small silhouettes who soon disappeared in the machine which flew away quickly. At this time, the headlights of the vehicle re-ignited and the engine of the truck started again at the first use of starter. Another witness in "La Carie" certified he saw this craft too. Interviewed by a journalist of the newspaper La Montagne, one of the witnesses on his arrival in Corbigny stated: "At the time when the engine stalled and the headlights died out, I was awestruck, for at about fifty meters of me, approximately, I came to see a machine of cylindrical form, of a rather large diameter, which I could compare to the 'saucers'. I clearly saw, on board this apparatus, three beings of small size, which appeared of weird form to me, but of which it was impossible to me to distinguish the features. It seemed to me that one of them was smoking, or then, it was a small light which was on board. My comrade and me, we were immobilized inside the vehicle and in impossibility of moving. It is only after the disappearance of the apparatus and its occupants that we could resume our travel. The appearance lasted only a few seconds but it was very clear and no doubt exists for me". Luc Chastan indicates that the beings were 1 m to 1.20 m tall, and that the sources are Mini catalogue chronologique des observations OVNI by Van Overmeire Godelieve, http://users.skynet.be/sky84985/; Chroniques des apparitions E.T. by Vallée Jacques DENOEL 1972 - coll. J'AI L; Ovni, Premier dossier complet... by Figuet M./ Ruchon J.L. Alain Lefeuvre publisher 1979. October 11, 1954 Henri Gallois, Louis Vigneron, Clamecy (Nievre), France 4:30 A.M.
Three small figures; en route to a fair, felt shock, paralysis, engine and lights failed; beings entered round craft and took off. Jerome Beau indicates that on October 11, 1954, at 04:30, in Sassier, France, close to "La Carie", misters Gallois and Vigneron, driving from Clamecy to Corbigny, feel an electric shock while the headlights of the car die out. "They see 1 object in the pastures, at approximately 50 m. It is cylindrical, rather thick, and 3 small beings stood near. No light is visible, except for 1 small reddish dot. The 2 witnesses are paralyzed until the departure of the object. A 3rd witness, Mr. Chaumeau, sees a luminous object flying above the wood of La Carie." Jérôme Beau indicates as source "Libération, le Parisien, October 14, 1954." While driving, Henri Gallois and Louis Vigneron felt something like an electric shock, which paralyzed them; at the same time the motor stalled and the headlights went out. Then they saw, 50 yards away, a cylindrical object. 3 small figures, making lively movements and gestures, were seen to enter the saucer, which flew off; the headlights went back on, and they could move again. Michel Padrines indicates that on October 11, 1954, at 04:30, in Sassier, France, close to "La Carie", misters Gallois and Vigneron, driving from Clamecy to Corbigny, feel an electric shock while the headlights of the car die out. "They see 1 object in the pastures, at approximately 50 m. It is cylindrical, rather thick, and 3 small beings stood near. No light is visible, except for 1 small reddish dot. The 2 witnesses are paralyzed until the departure of the object. A 3rd witness, Mr. Chaumeau, sees a luminous object flying above the wood of La Carie." Michel Padrines indicates as source "Libération, le Parisien, October 14, 1954." The website indicates that on 11 October 1954, at 06:00, in Clamecy, France, an object was observed, electromagnetic and physiological effects were noted, there were multiple independent witnesses. One white disc, around 100 feet away, was observed by two experienced male witnesses on a road for over 12 minutes. Three 3.5-foot-tall dwarves were seen. The sources are indicated as Webb, David, HUMCAT: Catalogue of Humanoid Reports; Michel, Aime, Flying Saucers and the Straight-Line Mystery, S. G. Phillips, New York, 1958; Bowen, Charles, The Humanoids: FSR Special Edition No. 1, FSR, London, 1966; Pereira, Jader U., Les Extra-Terrestres, Phenomenes Spatiaux, Paris, 1974; Vallee, Jacques, Computerized Catalog (N = 3073); Vallee, Jacques, Challenge to Science: The UFO Enigma, Henry Regnery, Chicago, 1966; Vallee, Jacques, Preliminary Catalog (N = 500), (in JVallee01); Vallee, Jacques, Anatomy of a Phenomenon, Henry Regnery, Chicago, 1965; Vallee, Jacques, A Century of Landings (N = 923), (in JVallee04), Chicago, 1969; Cramp, Leonard G., Piece for a Jig-Saw, Somerton, Isle of Wight, 1966; Schoenherr, Luis, Computerized Catalog (N = 3173); Binder, Otto, What We Really Know About Flying Saucers, Fawcett T1863, Greenwich, 1967; Hall, Richard H., The UFO Evidence, NICAP, Washington, 1964; Flying Saucers, Flying Saucers Magazine, (Palmer); Olsen, Thomas M., The Reference for Outstanding UFO Sighting Reports, UFOIRC, Riderwood, 1966; Delaire, J. Bernard, UFO Register Volume 7 (1976), Data Research, Oxford, 1976; Rodeghier, Mark, UFO Reports Involving Vehicle Interference, CUFOS, Chicago, 1981; Falla, Geoffrey, Vehicle Interference Project, BUFORA, London, 1979; Hall, Richard H., The UFO Evidence, Volume II: A Thirty-Year Report, Scarecrow Press, Lanham, 2000, ISBN:0-8103-3881-8; Hatch, Larry, *U* computer database, Author, Redwood City, 2002; Stringfield, L.
The website indicates that on 11 October 1954, in Clamecy, France, a car motor and headlights failed, passengers felt shock and numbness, a round UFO took off from nearby field, one ball was observed. The source is indicated as "NICAP Sighting Information Database." The website indicates that on 11 October 1954, at 04:30, in Clamecy-Sassier, France, while driving, Henri Gallois and Louis Vigneron felt something like an electric, which paralyzed them; at the same time the motor stalled and the headlights went out. Then they saw, 50 yards away, a cylindrical object. 3 small figures, making lively movements and gestures, were seen to enter the saucer, which flew off; the headlights went back on, and they could move again. The website indicates that on 11 October 1954, at 04:30, in Sassier, France, a cylindrical craft was seen with three dwarfs standing close by. 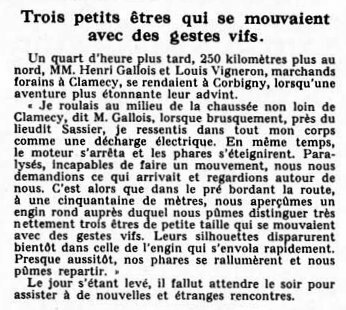 Messrs. Gallois and Vigneron who were driving from Clamecy to Corbigny felt an "electric shock" as the car headlights died. They then saw a craft in a pasture 50 meters away. It was cylindrical, fairly thick, and three dwarfs were standing close by. No light was seen, except a small, reddish point. Both witnesses were "paralyzed" until the craft left. A third witness, Mr. Chaumeau, had seen a lighted object fly over the woods at La Carie. The website comments that an object was observed, electromagnetic and physiological effects were noted, there were multiple independent witnesses, one red cylinder, around 100 feet away, was observed by two experienced male witnesses on a road for over 12 minutes, their names were Gallois and Vigneron. Three 3.5-foot-tall dwarves were seen. On October 11 in Sassier, near La Carie, Messieurs Gallois and Vigneron who were driving from Clamecy to Corbigny, felt an electric shock as the car headlights died. They then saw a craft in a pasture fifty meters away. It was cylindrical and fairly thick, and three dwarfs were standing close by. NO light was seen, except a reddish point. Both witnesses were paralyzed until the craft left. A third witness had seen a lighted object fly over the woods at La Carie. Vallee Case 234, citing Liberation + Le Parisien both of 14 Oct 1954. While driving, Henri Gallois & Louis Vigneron felt something like an electric shock, which paralyzed them; at the same time the motor stalled and the headlights went out. Then they saw, 50 yards away, a cylindrical object. 3 small figures, making lively movements & gestures, were seen to enter the saucer, which flew off; the headlights went back on, & they could move again. *Oct. 11, 1954 - At 4:30 a.m. in Sassier, near La Carie, Nievre, France two men, Messrs. Gallois and Vigneron, were driving from Clamecy to Corbigny when they felt an "electric shock" at the same time their car headlights died. They then saw a craft in a pasture 50 meters away. It was cylindrical and fairly thick in shape. Three dwarf humanoids were standing close by. No light was seen, except a small, reddish point of light. Both witnesses were paralyzeduntil the craft left. A third witness, Mr. Chaumeau, had seen a lighted object fly over the woods at La Carie, France. (Sources: Aime Michel, Flying Saucers and the Straight Line Mystery, p. 158; Jacques Vallee, Passport to Magonia: A Century of Landings, pp. 224-225, case # 234; Richard Hall, The UFO Evidence, p. 74; Thomas M. Olsen, The Reference for Outstanding UFO Reports, case 52). The author indicates that the close encounter of the third type of Clamecy, the Nièvre, on October 11, 1954, at 04:30 was a hoax. Henri Gallois and Louis Vigneron, fair merchants, went early to the fair at Corbigny. Hardly had they passed Clamecy, at the place called "Le Fassié" that their van stalled and that the headlights went out. A few seconds before, the witnesses had felt like a discharge of electric current all over the body. It was then that they saw in a field bordering the road, about fifty yards away, a round engine of a rather large diameter and greyish tint, from which they could not distinguish the details. Close to this object, the witnesses observed three beings of small size and bizarre form that moved with quick gestures, and soon disappeared in the craft that quickly flew away. Julien Gonzalez indicates that the sources of this report are Le Journal du Centre for October 13, 1954; Le Parisien for October 14, 1954; Aimé Michel, "Mystérieux Onjets Célestes", page 268; C. Garreau R. Lavier, "Face aux Extra-Terrestres", page 100; Jean Sider, Le Dossier 1954 et l'imposture rationaliste, page 195. Julien Gonzalez says that in fact, the next day, Le Journal du Centre for October 14, 1954 had revealed in an article titled "The saucer drank in the cup" that the whole story had been invented by MM. Gallois and Vigneron. No other newspaper had passed on this information so that this case remained for more than 40 years in ufological catalogs. He adds that he himself contacted Mr. Gallois in 2000, who confirmed the mystification to him. Barthel and Brucker claimed [bb1] they have in their file the newspaper Le Figaro for October 24, 1954, and that this source mentionned no occupants. I provided a scan of this source, [fs1], and it does mention the occupants, even in the headline! [---] Article in the regional newspaper La Montagne, Clermont-Ferrand, France, October 13, 1954. [---] "La soucoupe a bu la tasse", article in the regional newspaper Le Journal du Centre, France, October 14, 1954. [---] Article in the national newspaper Libération, France, October 14, 1954. [---] Article in the national newspaper Le Parisien, France, 14 Octobre 1954. [am1] "Mystérieux Objets Célestes", book by Aimé Michel, Seghers publishers, France, pp 214-215, 1958. [ue1] "The UFO Evidence", book by Richard H. Hall for NICAP, USA, page 73, 1964. [me1] "Les Soucoupes Volantes", article in the magazine Meccano Magazine, published by the Meccano toys co, France, page 9, July 1959. [am1] "A Propos des Soucoupes Volantes", book by Aimé Michel, Planète publishers, France, page 196, 1967. [---] "What We Really Know About Flying Saucers", book by Otto Binder, Fawcett publishers, U-K., 1967. [mc1] "Les Apparitions de Martiens", book by Michel Carrouges, (aka Louis Couturier), Fayard publisher, France, pages 80,104, 1963. [ni1] "The UFO Evidence", book by Richard Hall, for NICAP, USA, 1964. [jv2] Summary by Jacques Vallée in "En Quête des Humanoïdes", book by Charles Bowen, French translation of "The Humanoids", J'ai Lu publishers, France, page 49, 1974. [lp1] "Les Extra-Terrestres", booklet by Jader U. Pereira, in the ufology magazine Phénomènes Spatiaux, Special Issue #2, GEPA, France, page 52, 1974. [gl1] "Face aux Extra-Terrestres", book by Charles Garreau and Raymond Lavier, Jean-Pierre Delarge - Mame publishers, France, page 100, 1975. [gl1] "Face aux Extra-Terrestres", book by Charles Garreau and Raymond Lavier, J'ai Lu publishers, France, page 104, 1975. [---] "UFO Register", compiled by Bernard Delaire, Data Research, Oxford, U-K., 1976. [pd1] "Le Grand Livre des Objets Volants Non-Identifiés", book by Pierre Delval with the Oranos Committee, De Vecchi publisher, France, page 253, 1976. [---] Official UFO, magazine, USA, February 1976. [ns1] "Seeking the Mechanism for Paralysis in Close Encounter Cases", article by Richard C. Niemtzow, M.D., and John F. Schuessler, in the ufology bulletin MUFON Journal, Mutual UFO Network (MUFON), USA, #127, page 6, June 1978. [mr1] "UFO Reports Involving Vehicle Interference", compiled by Mark Rodeghier, CUFOS, USA, February 1976, available at www.scientificexploration.org/jse/articles/ufo_reports/rodeghier/1.html. [ls1] "Situation Red - The UFO Siege", book by Leonard Stringfield, Doubleday publisher, USA, 1977. [rs1] "Socorro Saucer - The Closest Encounter of Them All", book by Ray Stanford, Fontana-Collins publishers, U-K., 1978. [ls1] "Alerte Générale OVNI", book by Leonard Stringfield, French version of "Situation Red - The UFO Siege", France-Empire publishers, France, page 113, 1978. [fr1] "OVNI: Le Premier Dossier Complet des Rencontres Rapprochées en France", book by Michel Figuet and Jean-Louis Ruchon, Alain Lefeuvre publisher, France, pp 148-149, 1979. [bb1] "La Grande Peur Martienne", book by Gérard Barthel and Jacques Brucker, Nouvelles Editions Rationalistes publishers, France, pp 80-81, 1979. [si1] "Le Dossier 1954 et l'Imposture Rationaliste", book by Jean sider, Ramuel publisher, France, page 195, pp 251-252, 1997. [---] "The UFO Evidence, Volume II: A Thirty-Year Report", livre par Richard H. Hall, Scarecrow Press publishers, USA, 2000. [mp1] "Générations UFO", book by Michel Padrines, self-published, France, pp 123-124, December 2006. [jg1] "RR3 - Le Dossier des Rencontres du Troisième Type en France", book by Julien Gonzalez, Le Temps Présent publishers, France, page 436, 2014. 1.0 Patrick Gross December 14, 2008 Conversion from HTML to XHTML Strict. First formal version. Additions: [fr1], [bb1], [gl1], [go1], [jb1], [ls1], [mr1], [js1], [ud1], [ud2], [ud3], [ud4], [lc1]. 1.1 Patrick Gross December 20, 2008 Addition [ni1], [mp1]. 1.2 Patrick Gross Addition [mc1]. 1.4 Patrick Gross September 26, 2014 Addition [ad1], [ni1], [ta1]. 1.6 Patrick Gross December 21, 2016 Additions [lg1], [ub1]. 1.7 Patrick Gross December 31, 2016 Additions [fs1], [jg1]. In the Explanations, addition of the paragraphe "Barthel and Brucker..."
2.0 Patrick Gross January 31, 2017 Additions [me1], [jp1].